Your users are busy. They’re closing deals, providing top-notch service, and marketing to your prospects and customers. By creating customized pages, you can put key information at your users’ fingertips and provide them with an easy interface to update and add records. The Lightning App Builder is a point-and-click tool that makes it easy to create custom pages for the Salesforce mobile app and Lightning Experience, giving your users what they need all in one place. But that’s not all. When you edit a Lightning app from the App Manager in Setup, you’re brought into the Lightning App Builder to manage the app’s settings. You can update the app’s branding, navigation, options, and manage the Lightning pages assigned to that app all in the Lightning App Builder. In this module, we’ll be exploring Lightning page creation. Check out the Lightning Apps module for more information about editing apps with the Lightning App Builder. A Lightning page is a custom layout that lets you design pages for use in the Salesforce mobile app or Lightning Experience. A Lightning page is composed of regions that contain components. Here’s a sneak peek at one of the pages you’re going to build. The structure of a Lightning page adapts for the device it’s viewed on. The template you choose when creating the page controls how it displays on a given device. The Lightning page’s template divides the page into regions. Standard components are Lightning components built by Salesforce. Custom components are Lightning components that you or someone else have created. You can configure custom Lightning components to work in Lightning App Builder. The Lightning App Builder’s user interface makes creating Lightning pages easy. Here’s a breakdown of the parts of the tool. When you’re working on a Lightning page, the header shows you its label, and contains a Pages list where you can see the last 10 pages that you modified. You can also return to Setup without saving or to view more help for the Lightning App Builder. If you’re editing an app, the header also shows the app name and contains an App Settings tab where you can configure the app’s options such as branding, navigation, and the utility bar. In an app context, the Pages list shows all active Lightning pages associated with the current app, including record and app pages assigned to the app, and all Home pages that are assigned to a profile. Use the buttons in the toolbar to cut ( ), copy ( ), and paste ( ) page content; and to undo ( ), redo ( ), save, or activate your Lightning page. You can also view your page in different formats, refresh the canvas, or adjust the canvas size to fit your view. The components pane contains all standard and custom Lightning components that are supported for your Lightning page. Click and drag a component to add it to the page. If you have a lot of custom components, enter text in the search field to easily find the one you need. You can access third-party custom components on the AppExchange using the button at the bottom of the pane. The canvas area is where you build your page. Drag components to reorder them on the page. Depending on what you select on the page, the properties pane shows either the overall page properties or the properties of the component that you’ve selected. Click Page in the breadcrumb to access the page properties when viewing a component. 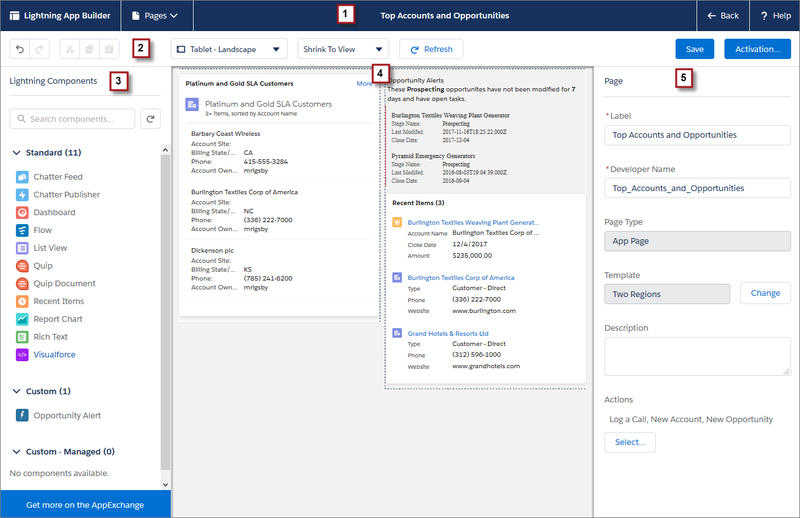 You can create different types of Lightning pages with the Lightning App Builder. In this module, we'll look at these three types. Use an app page to create a home page for a third-party app that you can add directly into the Salesforce mobile app and Lightning Experience navigation menus. Your users then have an app home page where they can quickly access the most important objects and items. Create Home pages with features relevant to specific types of users, and assign the customized pages to different apps or app-and-user-profile combinations. Custom Home pages are supported in Lightning Experience only. With a record page, you can create a customized version of an object’s record page, tailoring it to your users’ needs. Custom record pages are supported in Lightning Experience only. Let’s start with the Home page.